Boiled, steamed & microwaved in stews, salads & casseroles. Dips for artichokes include Hollandaise sauce, plain yogurt blended with Dijon mustard, mayonnaise, light mayonnaise or mayonnaise blended with lemon juice. 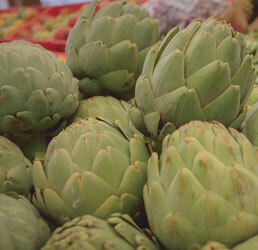 Artichokes are very low in Saturated Fat and Cholesterol. They’re also a good source of Niacin, Vitamin B6, Iron and Phosphorus, and a very good source of Dietary Fiber, Vitamin C, Vitamin K, Folate, Magnesium, Potassium, Copper and Manganese. An artichoke is Actually a thistle and a member of the sunflower family. The artichoke itself is a flower bud or immature flower head. The tender bases of the petals and the fleshy heart to which the petals are connected are the edible portions.